Ervin’s first novel is both slyly humorous and deeply thought provoking. Ray Welter is a wildly successful Chicago advertising executive- but he’s disgusted by his complicities in commercialism and alert to the Orwellian overtones in the world around him. Reaching rock bottom through too much whiskey and a failed marriage, he escapes to a remote island off the coast of Scotland. There he rents the house where George Orwell wrote 1984, hoping that isolation and immersion in Orwell’s writings will provide him the truth that he seeks. Taking up residence in an eccentric - and sometimes dangerous - community just may redeem him. A darkly comic debut novel about advertising, truth, single malt, Scottish hospitality--or lack thereof--and George Orwell's Nineteen Eighty-Four. Ray Welter, who was until recently a highflying advertising executive in Chicago, has left the world of newspeak behind. He decamps to the isolated Scottish Isle of Jura in order to spend a few months in the cottage where George Orwell wrote most of his seminal novel, Nineteen Eighty-Four. Ray is miserable, and quite prepared to make his troubles go away with the help of copious quantities of excellent scotch. But a few of the local islanders take a decidedly shallow view of a foreigner coming to visit in order to sort himself out, and Ray quickly finds himself having to deal with not only his own issues but also a community whose eccentricities are at times amusing and at others downright dangerous. Also, the locals believe--or claim to believe--that there's a werewolf about, and against his better judgment, Ray's misadventures build to the night of a traditional, boozy werewolf hunt on the Isle of Jura on the summer solstice. Andrew Ervin grew up in the Philadelphia suburbs and has lived in Budapest, Illinois, and Louisiana. He has a degree in philosophy and religion from Goucher College and completed his MFA in fiction at the University of Illinois at Urbana-Champaign. His writing regularly appears in The New York Times Book Review, USA Today, The Washington Post, The Believer, Salon, and elsewhere. He currently lives in Philadelphia with his wife, flutist Elivi Varga. He is the author of Extraordinary Renditions, a collection of novellas. 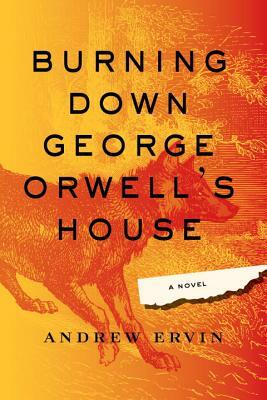 Burning Down George Orwell's House is his first novel.